A listing template controls how the listing description looks on eBay, and what content is included. While you might need multiple profiles for different types of products, most users only need a single listing template since the header, footer and general styles are usually the same for all your products. It is required to create a listing template before you can list your items on eBay. You can easily modify the default template using the WYSIWYG template editor. If you have some HTML and CSS skills, you might as well build your own template using the built in code editor or your preferred editor via FTP. Or you can outsource your template design to a third party developer and simply upload the created template as a zip file (see below). If you have completed the first time setup you should already have created a listing template based on the default template – but you can modify or change your template any time and revise all your published listings to update their description on eBay. To create a new template based on the default template visit WP-Lister » Templates and click “Add New” or “Create New Template”. The templates page also allows you to preview, duplicate or download your created listing template. If you want to modify an existing template but keep a backup of the current version, you should duplicate your template and then work on the copy which allows you to compare both version using the preview feature. Or just click on “Download” to save a backup copy to your computer. 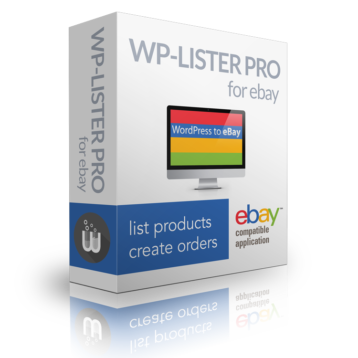 WP-Lister comes with a default listing template which features various options to customize its look – without knowing anything about HTML or CSS. 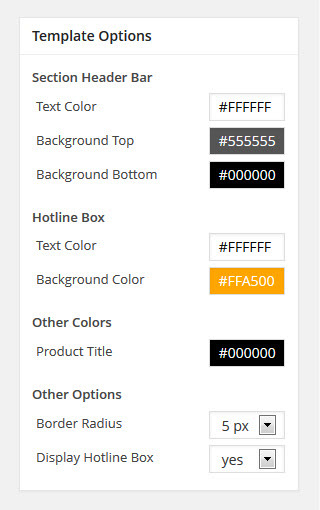 You can easily change the all colors used in the template – namely the header bars text color and background gradient, the hotline box text and background color and product title text color. Other options include border radius which you can adjust between zero and 12px and the option to disable or enable the hotline box. Developers can customize the available template options – and create their own options – with just a few lines of PHP code. Check out the functions.php section in the template editor to see how the default template options are implemented. You can use the following shortcodes in your listing template. These are not global WordPress shortcodes – just simple placeholders for product specific content which only work in listing templates. Insert cross-sell widgets – a thumbnail gallery linked to your latest additions, items which end soon, WooCommerce cross-sells or up-sells, or items marked as featured in WooCommerce. Template developers can implement custom shortcodes in PHP. An example code snippet is provided in the functions.php section in the template editor. To learn more about these advanced options see Advanced Settings » Listing Templates. Importing a custom listing template is just as simple. Visit WP-Lister » Templates click the “Upload existing template” button, browse for the template file on your computer and click “Upload”. Note: You can only import a listing template that has been created for WP-Lister – or been exported from within WP-Lister. Listing templates that were created for other listing applications like TurboLister can’t be imported – they would first have to be converted, which is something that any skilled web designer could do.